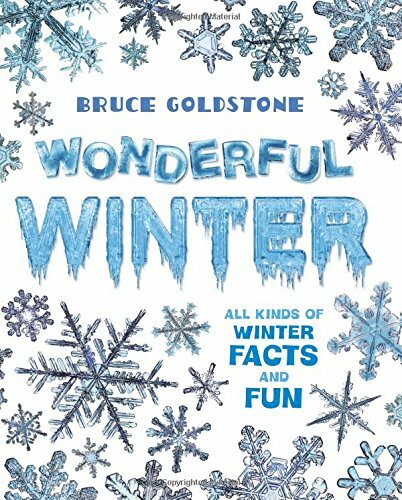 Summary: All kinds of facts about winter are presented, illustrated with large, colorful illustrations. There’s scientific information about the solstice, snow, animal adaptation, cold, and the simple machines that are used to shovel snow. The sounds, sports, tastes, holidays, and feelings of winter are all highlighted with their own two-page spreads. The final four pages include photos and instructions for six winter activities. This is a follow-up to Bruce Goldstone’s book Awesome Autumn, and from the looks of things at the end of this book, I would say Spectacular Spring cannot be far behind. 48 pages; ages 4-8. Pros: A very thorough introduction to winter for the primary grades. Easy-to-understand science information is interspersed with quick takes on some of the words used to describe winter. Young readers will enjoy the large, clear photos of familiar winter objects. Cons: The “fake snow” activity that involves shredding a disposable diaper sounds a bit messy.